For the holidays, I was gifted two small Lodge H3SK Heat Enhanced and Seasoned Cast Iron Skillets. They’re perfect for making a small Dutch Baby for when you’re craving something sweet for brunch, but you also want something savory. I recently picked up some Grapefruit Curd at the store (Condiment, they have plenty of great looking sauces), and I was itching to use it. 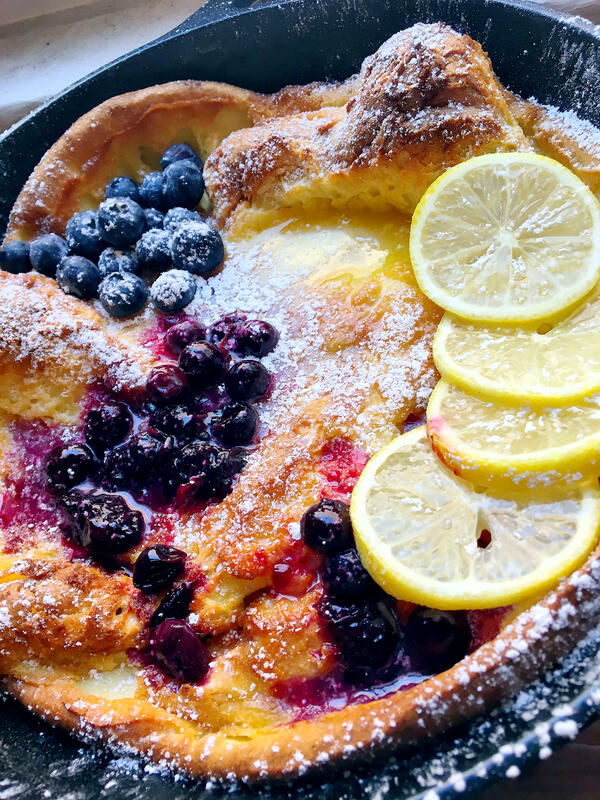 The Dutch Baby was the perfect application and I was able to get a little creative with the flavors. I’ve also been experimenting with the gluten free and dairy free lifestyle so I used ingredients to accommodate that. I love biting into pomegranate seeds and getting that sweet burst of juice, and I knew the sweetness from the pomegranate would play well with the tartness from the grapefruit curd. To keep this from being a very sweet, I also topped it with some fresh basil to add a subtly earthy flavor and this may have been my favorite Dutch Baby to date. And, it unintentionally looks like Christmas, if you make it in December you’ll be very festive! Add eggs, flour, milk, sugar, vanilla, salt, and grapefruit zest together into a blender and blend until smooth. Place butter in a cast iron skillet and place in the oven until butter has melted (just a few minutes). Pour the batter into the pan, return them to oven and bake for 20 minutes, until the pancake is puffed and golden. Lower oven temperature to 300 degrees and bake five minutes longer. Remove the pancake from the oven, top with grapefruit curd, pomegranate seeds, and fresh basil. Cut Dutch Baby into wedges and enjoy! This recipe is gluten-free, dairy-free, and vegetarian.